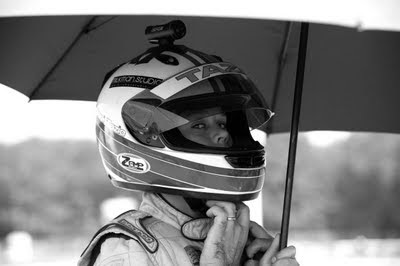 After a strong overall performance and exceeding our expectations in our first WKA Regional Season, Tazio is set to drive in our first WKA National Race Weekend. 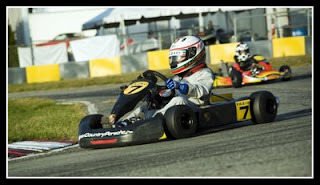 It's the legendary Daytona Kartweek on December 28-30, 2009. 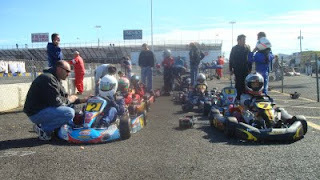 The first race of the 2010 WKA Manufacturer Cup National Championship. 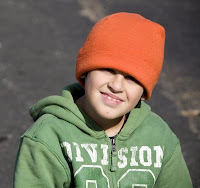 Tazio at 11 years of age on 12/13/09 will be competing in Cadet class. He will race in a field of 50 + national level drivers expected to be the best in the country. We don't expect to be running at the front on our first National race. We do believe that Driving together with this level of competition will sharpen Tazio's race craft to the next level. We are thrilled to race in the legendary Daytona International Speedway, home of the Daytona 500 and the 24 hours of Daytona. We will join forces with the Mike Doty Racing Team. Mike Doty, a karting champion himself, coached many drivers to victory, including National Championships. 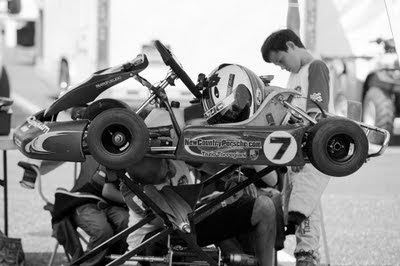 Mike Doty will be looking after Tazio and his chassis together with another great tuner/coach, Mike "Chi Chi" Ramirez. Last Sunday we were at Englishtown NJ for a club race. 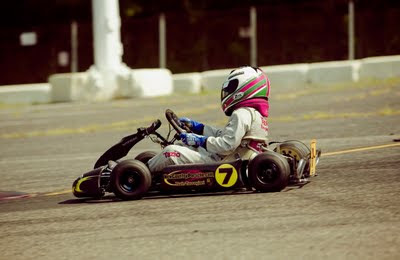 Doty had Tazio drive one of his Merlin chassis in trying to prepare and figure out the right kart to use for next month. The Merlin is much newer than the worn but fast Nevoso kart we have been using. Setup wasn't easy with a damp drying track during practice. But in no time after making some key changes Tazio's lap times continued to drop. In the final race after a great start from the third row, Tazio pushed the two karts on front of him hard and finished fourth with an unfamiliar Merlin chassis. He was able to gain ground in the club points standings with his two closest rivals. He definitely had the speed to run in the top three. Another trophy for the collection. This Sunday November 22nd will be our last race of the 2009 Raceway park club season. Chi chi wants Tazio to drive the Merlin again to become more familiar with it. Tazio thought the rear was a little tight, so we need to free it up a bit and hopefully find more speed. Our other half of the team Dario and my wife Lucia couldn't make it as they were both under the weather. 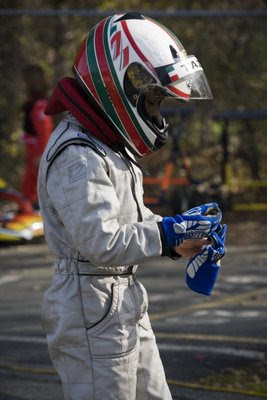 October 24th and 25th was the last race weekend of the 2009 WKA New Jersey Sprint Series. Fortunately for us the forecast for Saturday all day rain was accurate. I had changed the chassis set up for the wet to find grip in a slippery damp track. Tazio's first race teacher Mike Doty pointed out that our old rain tires needed replacement to be competitive. We took his advise and got it done with Dario's help (Tazio's brother). Tazio was immediately among the fastest in the wet. 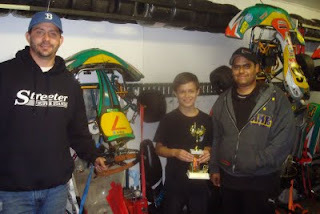 He was able to win his first WKA regional heat race and two podiums in the finals for Cadet and Junior sportsman classes. 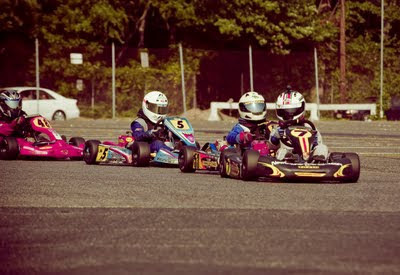 He tangled with another kart at the start of one of the heat races which dropped him to the back of the pack. His fast laps and careful driving enabled him to stay on the track and catch most of the field (click here to see the video). By the end of the day Tazio was soaked, but also very happy to pick up his two large 2nd and 3rd place trophies. On Sunday it was sunny and dry. It took us a while to find the right set up. He couldn't finish one of the heat races because of a loose wheel. He was smart to notice and stop before loosing the rim all together. I took the blame. This didn't help his qualifying which resulted in a sixth starting position. He finished his last race of the weekend fifth, however a well earned fifth with a brilliant last lap pass on his rival. Dario was of great help to the team changing the set up between sessions on both days. After a brilliant drive in his first WKA Regional Series and and a racing accident which forced him to miss two finals, he was able to finish fifth in the points in both Cadet and RP Junior Sportsman classes. This makes Tazio an award recipient at the end of season banquet in December. We'll be back at Englishtown on November 15th for the next Raceway Park club race. 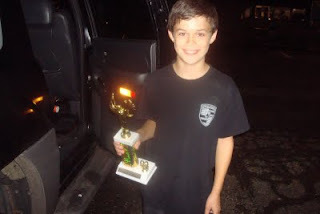 After our WKA Regional Event at NJ Motorsport Park on September 13, our racing team had a month break, which we very much needed to repair and rebuilt the kart, and for Tazio's foot to heal, which after a couple of soccer games it proved to be perfect. 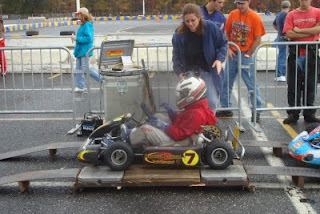 We came back to track at Englishtown on October 11 for the next Raceway Park Club Race. For the first time the track was run backwards which was like racing at a new venue. On Saturday they had open practice all day for drivers to learn the new track. We couldn't make it. The time during the break really gave me the chance to take the kart all apart, clean it and put it all back together. When I was done it felt like a new machine. When Tazio hit the track first thing in the morning for the first practice session he was fast out of the box. The great Mike Doty helped us tune the kart which made our lap times drop each session. Tazio managed to qualify fifth out of fifteen. In the feature race he had a great start, stayed out of trouble and was able to finish fourth. He wasn't able to catch the top three but was able to open a large gap to everyone else behind him. The three that finished on front of Tazio were among the drivers that practiced on Saturday. We were happy with the result. Watching Tazio's face pick up his fourth place trouphy showed us that his accident didn't slow him down. 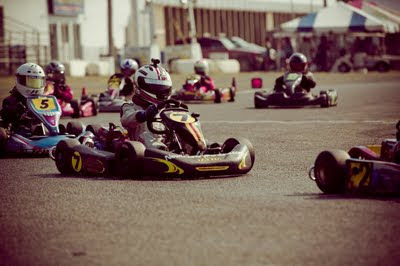 This weekend is our final 09 WKA NJ Sprint Series race weekend, it's at Englishtown NJ. Backwards again. We'll be there first thing Saturday morning. This past weekend of September 12 & 13 was our team's 4th WKA Regional Race weekend. The track was the 1.1 mile circuit at NJ Motorsport Park in Millville. 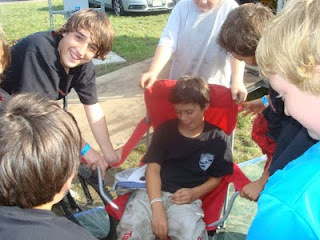 During one of the final heat races on Sunday Tazio had an accident. 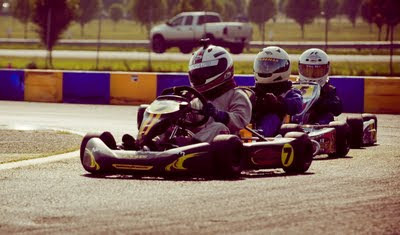 While he was battling for position the tires on the two karts touched. Tazio's kart went up in the air and he was thrown out of his seat. When he landed on the ground he got up right away just to realize that his foot couldn't hold his weight and went down again. The race was immediately red flagged and stopped. I ran to him right away escorted by the track director. The track ambulance arrived immediately and the response was very professional. While Tazio was being checked His Mom Lucia was brought on the scene by one of the track workers. 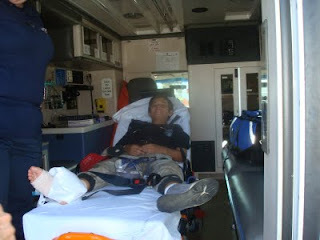 The ambulance took us at the Track medical center where Tazio was checked by a race doctor. The doc said the foot was either fractured or sprained, and that Tazio was otherwise OK. 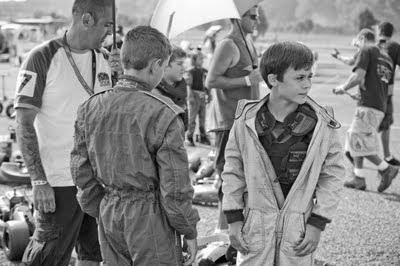 When the ambulance brought us back to the kart track pits all his fellow racer kids were clapping and cheering as Tazio came out. It brought a big smile to his face, I think it was special moment he will never forget. Tazio didn't want to leave, he wanted to sit track side and watch his friends race in the two final races. He was very disappointed he couldn't race in the finals. The next morning after some X-rays, Tazio's doctor said nothing was broken. Fortunately he only sprained the top of his right foot. He already started walking since Tuesday morning and getting better very rapidly. Our next race is not until October 11th which will give him plenty of time to heal 100%. 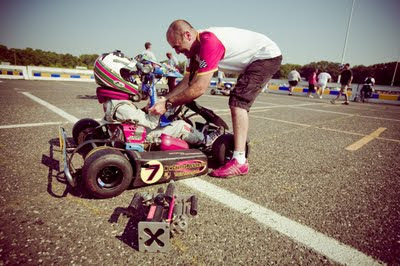 I also need the time with Dario's help to check, fix and prepare the kart. Tazio's said he didn't get scared from racing but definitely learned from it. Last Sunday August 23rd 2009, We had our best Heat race this year. 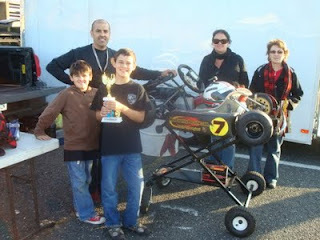 The kart was working really well, and Tazio ran one of his best races yet. He was the one to beat. From fourth he managed to come forward and catch the very fast and National #80. Although it was not a feature race, it was one of Tazio's great wins. 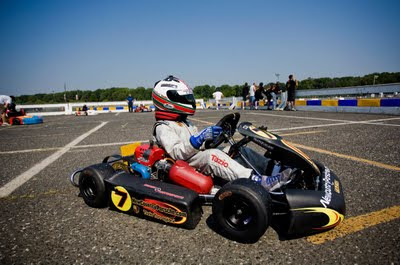 Get on Board with Tazio and go for a ride as he pushes his kart on the edge. Our official racing team photographer is Lucia's brother, Joao Carlos. The quality of his work is second to none. His ability of catching Tazio at speed is remarkable. It requires experience and patience. 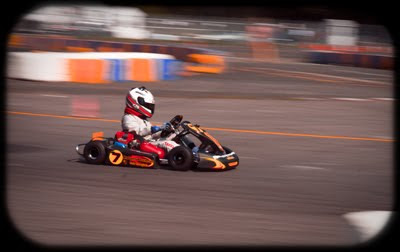 On Sunday August 16th Joao was on track at one of our club races with his camera gear. His beautiful girlfriend Carly was also on location. Not only is she a model and a make up artist, she is a wonderful photographer as well. Joao is also one of our team sponsors and his MilkManSudio.com logo is on the helmet and on the race kart. If you ever need professional photos look no further. Our official website address has been updated from tazioracing.blogspot.com. Our new domain name will make it easier for us to share our website with everyone while creating a brand at the same time. We appreciate the support of anyone that visits and shares our site. Our wonderful latest newspaper article now is also available on the web for anyone to see anytime on the archives of the Greenwich Citizen. A big thank you to Rob Kelly and the Greenwich Citizen for an outstanding job. 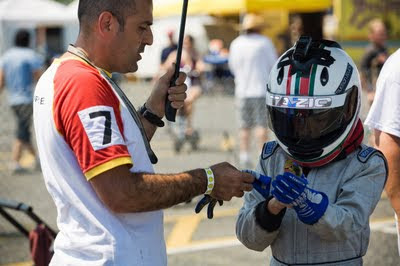 This past weekend of August 7th-9th 09 was our third WKA Regional Race weekend in Englishtown NJ. Cadet Class. We arrived Friday afternoon with the whole team for practice. Thanks to Tazio's marvelous driving and feedback Dario and I were able to figure out the right set up and choose which carburetor was best. Saturday was a beautiful hot day. 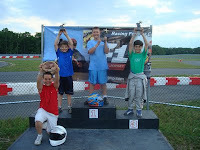 In Tazio's first feature 14 lap race his kart got better mid race. While in 5th position he closed in on the three karts on front of him as they were trying to lap a slower driver. He saw a gap of opportunity as they were all approaching the pits turn and went for it. They were four abreast trying to line up for the left turn in with Tazio in the middle and he got hit hard on the right rear wheel which blew out his entire rim valve stem giving him an instant flat tire and a retirement instead of the second place he was hoping for. Racing accident. On Sunday morning the rain came. Which meant we had to start from scratch with a wet setup. You should have seen how fast Dario was changing the tires. During one of the qualifying heat races there was another accident. As Tazio was diving into the light pole right hander with Ryan Raffa (CKI National Winner) on the outside, another kart on the inside that refused to give up the just lost position stayed on the gas and hit Tazio on the right side pushing him into the side of the other kart, unfortunately Raffa got the worst, his kart went airborne several feet off the ground landing hard on his front tires. He got out of his kart right away but was in pain. He had to spend some time in the ambulance for check up. He was fine. Our kart sustained damage in the front steering increasing our work in the pits. This resulted in a sixth starting position for the second and last feature regional race. This time nothing went wrong and Tazio was very fast from the dropping of the green flag. He passed for fifth, than after a couple of attempts passed for fourth, and on the white flag which marks the final lap, he set his kart glued to the kart on front him going into the final straight catching the slipstream and passing for third. My friend Chris Buccieri who came to see the race was screaming so loud cheering for Tazio's name on the grandstand that everybody around us started cheering as he made each pass. The look on Tazio's face as he was removing his gloves was priceless. It was a job well done for the whole team including Mamma who's lunch was delicious. I couldn't have tune the kart this good without Dario's hard work and help. We came home with more brass for our trophy collection. This Sunday we race again in our Racewaypark Club series. 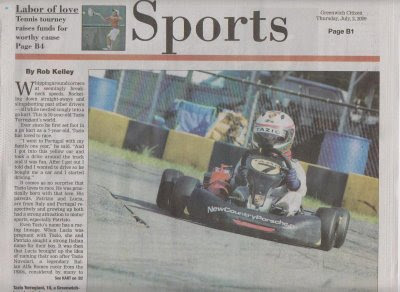 The Greenwich Citizen decided to do a story on our racing family. It was wonderful! We had been on the Greenwich Times almost two years ago, but this time it was two full pages with three photos. Sports writer Rob Kelly came to our house for the interview and did a very professional job with the article, we received so many compliments on it. The kids were very exited and amused to see themselfs on the paper . Thanks Rob. The Last few races were action packed. 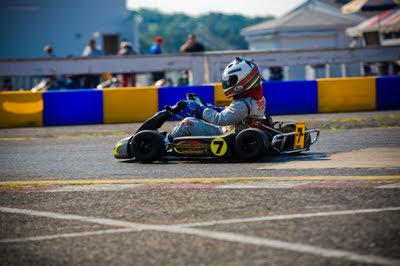 In our regional on the June 12th weekend we had our share of mechanical failures while trying to find the right set up at a new track in NJ Motorsports Park in Melville NJ. The problems included Tazio's rear axle snapping in two under stress during practice, also a broken clutch, broken seat strut and the engine overheating during the final race. 7th and 8th was the best we were able to manage in cadet class. 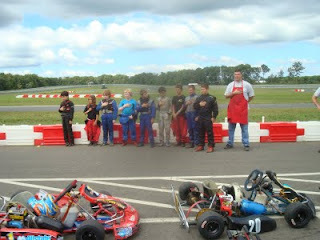 In RP Juniorsportsman class we did much better on older tires securing the podium, finishing 3rd in both races. We brought home two nice trophies. The 1.1 mile new track was wonderful, our favorite so far. 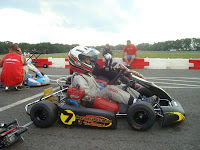 On June 27th we had our first Saturday night race at Englishtown NJ. 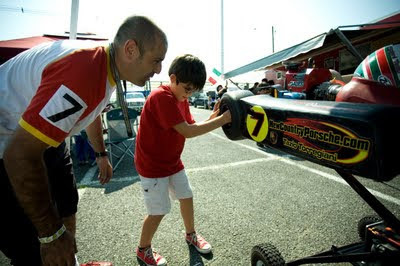 With Dario's help we were able to fine tune the kart correctly. Tazio got to work with another great drive to third place. We were able to film some of the action with a new helmet cam we have. You can view it on our youtube channel. This is our first blog post and we are excited to publish our racing stories. 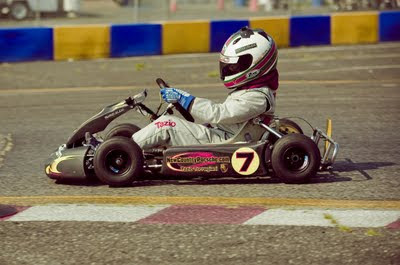 We are the Torregiani family and also the NewCountryPorsche.com Kart Racing Team. My name is Patrizio, I am the father and husband and Team Manager. 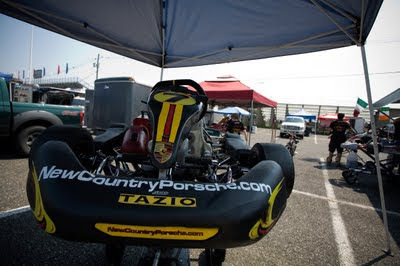 I am also Internet Manager for New Country Porsche of Greenwich in CT.
Tazio is the racing driver. 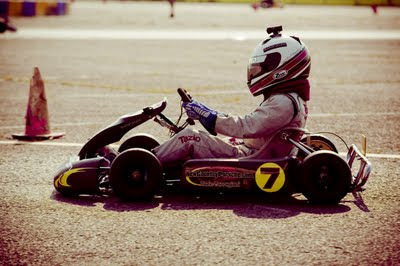 He started driving and racing karts when he was six. He is now ten, winner of 14 kart club races thus far and 07 OVRP Novice Cadet Club Champion. He is very fast and precise. Since the beginning he's always been towards the front. He is very focused especially just before a race start. 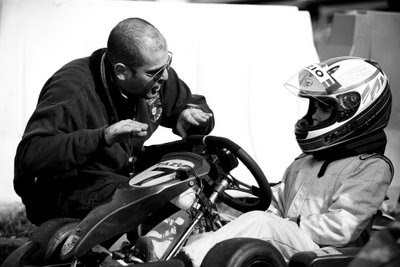 When he first stepped on the accelerator of a gas powered go kart in Portugal we knew he was a natural. Dario is the mechanic apprentice. He loves to be part of the team. He helps me work on the kart with set up and tuning. He loves especially to remove or install the wheels with the power gun. 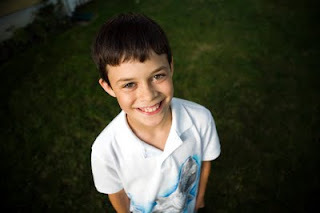 He is also a talented photographer, he helps us capture great memories. He is full of life and loves to make us laugh at every opportunity. Lucia is my wife and mother of Tazio and Dario. She is also the team coordinator. She makes sure we have food and clothes and everything we need to operate. She gives us all great support. We couldn't win without her. This year we are taking our racing to the next level in WKA regional competition. 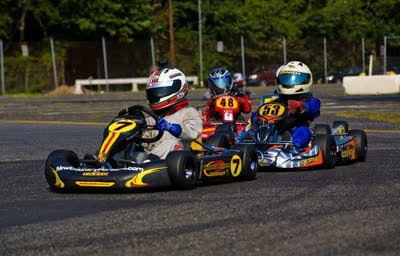 We are running the WKA NJ Sprint Series. The competition will be much stronger, with more entries with National recognition. Tazio exceeded our expectation by finishing second in race one and giving his Mom a great Mother's day gift. He finished fifth in race two on the same weekend and is currently 2nd overall in the points standings. We can't wait for the next one.